RBH.GirdledGirl.72dpi, originally uploaded by bbmarie. I continue to feel a great desire to be connected to the natural world. We have been gardening and caring for animals by keeping egg laying chickens and breeding rabbits in the back yard. Wednesday Shepherd shot a squirrel with his 22 pump gun and we butchered it together. We ate squirrel vegetable soup for lunch today. Winter has had us in a vice grip for 3 hard months. I gave up trying to keep my carriage house studio warm with the wood stove so I moved into the basement 'till spring. We came back from our year in Brooklyn with a great hunger to connect with the soil and rediscover relationships with animals beyond having them as pets. We are on a journey that feels like it has just begun. I bought a 1949 series catalog a few months ago and have been enjoying it as a touch stone with the past. The women's underwear section is particularly interesting for how different it is from what might find in a Victory's Secret catalog. The girdles look like they may have been designed by the same men who where designing suspension bridges and Pontiac bumpers. Women found liberation in the 70s or did they? 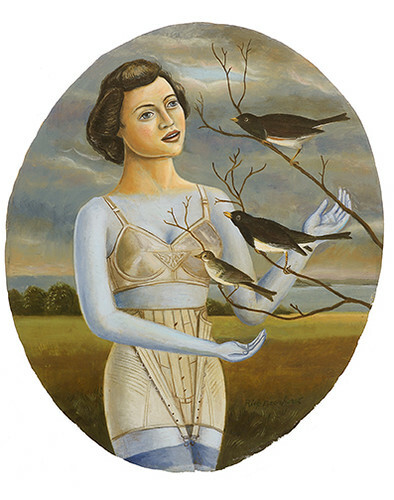 And what is the connection between women's foundational undergarments and trying to connect with nature? I am not sure but I hope to begin to find bridges of understanding as I make these paintings.